Bob has worked in the tree service industry since 1978 as a climber, contractor, instructor, consultant, and expert witness. He was also one of seven founding What Makes Bob an Expert?members of the Professional Tree Care Association of San Diego County founded in 1985, an organization that has increased the quality of tree care and tree care providers throughout the county. As a climber for the County of San Diego and Homestead Tree Service Inc., he has dealt, firsthand, with trees from the bottom up. Climbing to prune or remove as well as stump removal, planting and transplanting, he has put into practice the continuing education he acquired in college and ongoing seminars. As a California State licensed contractor, he has dealt with trees, There are less than 160 Registered Consulting Arborists in the United States.clients, employees, government entities, local and state regulations & tree ordinances, insurance, and equipment. He continued to increase his knowledge thru seminars, becoming the first certified arborist in the County of San Diego back in 1985. In January 2001, he became one of only four Registered Consulting Arborists in San Diego County and less than 160 in the United States. 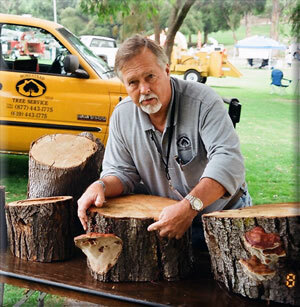 As an instructor, Robert has taught at numerous Professional Tree Care Association meetings and seminars, as well as annual seminars of the Western Chapter International Society of Arboriculture held at Disneyland and San Diego, an Urban Forest Council meeting, and the Mycology Society of San Diego. He has also instructed in pruning techniques to include many for the ground crew of the Chula Vista School District (the largest elementary school district in the country). 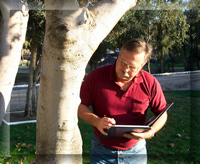 As a consultant, Bob has helped preserve some of San Diego's historic trees, assisted homeowner's in the care of their trees, consulted for corporations to include Jack in the Box and San Diego Marriott, worked with attorneys and insurance adjusters in valuations and legal disputes, mediated between homeowners in tree disputes, as well as legal mediation and consulted and advised government entities to include the U.S. Navy, California Department of Parks, County of San Diego Department of Public Works and Department of Parks and Recreation, the City of Lemon Grove and the City of San Diego, City of Encinitas,as well as school districts to include Chula Vista School District, San Ysidro School District, San Diego City School District, and the Del Mar School District. As an expert witness, he has worked with attorneys and insurance companies bringing experience, knowledge and objectivity to the table thru consultations, depositions and court testimony. All this has given Bob a wide range of experience and knowledge with a wide perspective in the field of arboriculture from the roots and the soil they grow in to the uppermost part of the tree canopy, from the residential landscape to the wooded lot, from the classroom to the court room and from the book to the field. Click here for Bob's qualifications & memberships. Robert Walton is a Registered Consulting Arborist (#394) with the American Society of Consulting Arborists and a Certified Arborist (#WC‑0192) with the International Society of Arboriculture. Robert is also TRAQ (Tree Risk Assessment Qualification) certified. He is a state licensed contractor (#429630) in the tree service trade. Robert has been in the tree service industry since 1978 and is committed to the preservation and protection of our urban forest, the quality of life it provides and its historical heritage. Bob has consulted on several historical trees in regards to their preservation.